Uber Family adds features to promote trust and transparency —allowing Uber to lower the minimum rider age and increase ridership while still still ensuring rider safety. Transportation can be a difficult thing to coordinate for busy families. That is why we created Uber Family. Using Uber Family, parents are able to feel safe booking rides for their teenaged children—receiving real time notifications at the time of pick up, as well as updates on arrival times and unexpected delays. Payments are made seamless through Uber Family by allowing children and parents to share one payment option. The sprint team consisted of four members. I worked as the UX lead, conducting user interviews, persona development, and user flows. From there, we tested concepts and developed high fidelity prototypes. Uber came to us to develop ideas for how they could lower the minimum rider age through a new offering called Uber Family—all while continuing to grow ridership and not limit the number of available drivers. Parents in many urban areas were already utilizing Uber to order rides for their young teenagers (who were under the minimum rider age of 16). We were asked to develop design ideas that would allow users to create family accounts, share payment options, and implement features that would make both parents and drivers feel safe with the devision to lower the minimum rider age to 14. Implement solutions so parents, riders and drivers feel safe lowering the minimum rider age to 14. With Uber Family, we are helping busy parents deal with the chaos of organizing transportation, all while ensuring that their loved ones are safe. Our solution seamlessly adds Uber Family within the existing app—ensuring parents stay up to date about where and with who their younger children are riding. Uber Family allows users to create family accounts — adding children as young as 14 years old. Riders aged 14-16 are placed on “Limited Access” accounts, so parents can keep track of where their children are. Parents have the option to restrict the number of places their teenagers are able to go by limiting pick up and drop off destinations to a set of preloaded destinations (such as home, school, friends houses, etc). Parents also have the ability to turn on and off notifications for each family member. If turned on, parents receive alerts the moment their children requests a ride. Once the child is in the car, parents receive realtime notifications about arrival times and unexpected delays—letting parents know that their child is safe at every point of the ride. To help both young riders and parents feel even more safe, we’ve added the “SOS” button. Tapping this button allows riders to easily make emergency calls— alerting the local police and all family member accounts that the rider is in trouble. We spoke with a number of parents who had teenagers between 14-16 to gain a deeper understanding of how they felt putting their teenager in an Uber. Many parents expressed the need for organizing after school transportation for their busy teenagers, yet had concerns regarding safety when asked if they would use Uber for their teens after school transportation. We discovered that all parents had a strong desire to know where their child was and who they were with at all times. Next, we spoke with teenagers to discover how they got places after school. Many of them took busses, had a nanny for transportation, biked, or rode with older friends. We also asked them to explain what they did if their plans changed and were told that they had to call or text their parents for permission. Through talking with teens, we also discovered that many of them didn’t have a credit card, which confirmed the need for multiple users to be able to charge the same credit card. Through speaking with Uber drivers, it became clear that there were already a number of parents who were booking rides for their young teens (even though the platform currently has a minimum rider age of 16). Drivers desired that the minimum rider age was lowered so that they were not put in tough situations in the future. We used personas and user scenarios to help understand how and when people might use Uber Family. Through our scenarios, we discovered that there was a need for more than just immediate family members to be added to Uber Family accounts. 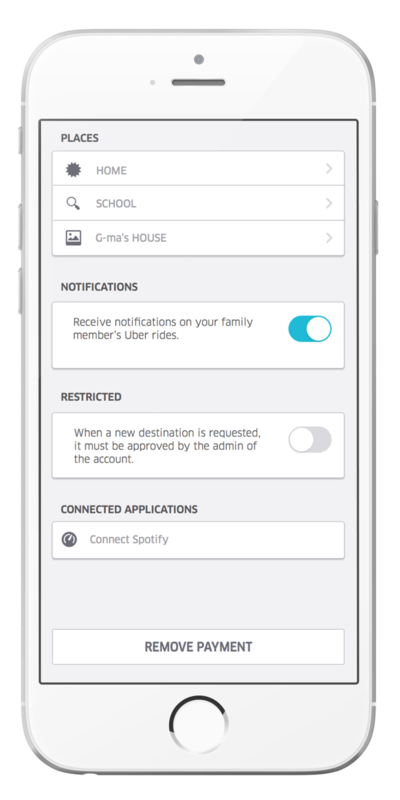 We wanted to ensure that Uber Family fit seamlessly into the app’s existing design patterns. It was also crucial that our design fit within Uber’s existing transportation model and not limit the available drivers, but rather included features that would ensure trust and transparency.